Location: Mahee Island, County Down, Northern Ireland. Ownership / Access: Open to public. 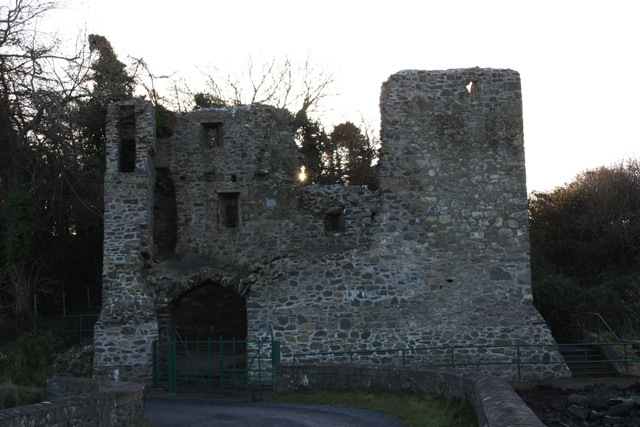 Notes: Mahee Castle, also known as Nendrum Castle, is a small ruined tower house near Nendrum Monastery on Mahee Island in Strangford Lough, County Down, Northern Ireland. It was built in 1570 by Captain Thomas Browne. It was abandoned by the early 17th century, and fell into disrepair. In 1923, H.C. Lawlor and the Belfast Natural History and Philosophical Society partly renovated the tower house to avoid further erosion and built a buttress wall to support the northwest corner of the tower.